HUITEX® Geomembrane is made from premium virgin polyethylene resin, blended with adequate carbon black and antioxidant to ensure the excellent UV resistance and durability. We use, and only use the raw materials with highest quality. All manufacturing facilities are state-of-the-art and maintained carefully and regularly. The Quality Control Laboratory of HUITEX is capably equipped to perform a wide range of conformance tests on Geomembrane products. All laboratory instruments are checked and calibrated regularly to ensure testing accuracy. 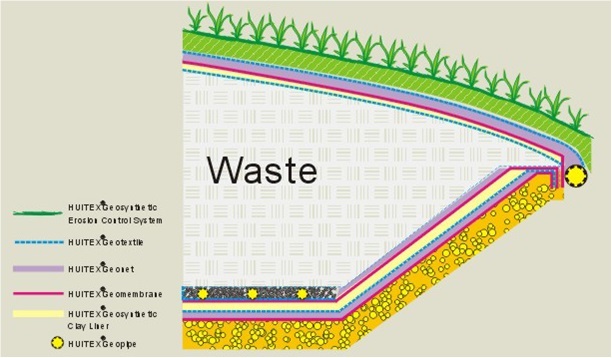 Landfill uses various types of Geosynthetic products to ensure the integrity of the landfill system. For environmental protection, it is essential the waterproof Geomembrane liner be the barrier layer on the floor and sides of a containment facility. To protect the valuable underground water resources landfill needs to deploy more than a smooth surfaced HDPE Geomembrane. Steep slopes become desirable for landfill to increase the capacity and diversify the location selects. Smooth liners have problems to make the top soil stay in place so HUITEX provides co-extruded textured Geomembrane for lining steep slopes. HUITEX® textured HDPE Geomembrane is made up of unique co-extrusion textured finishes to utilize the fiction advantage for lining slopes. HUITEX® textured HDPE can provide outstanding friction between HUITEX® textured and all kinds of Geocomposite(Geotextile) and the top soil. Capping is the barrier layer on top of a solid waste containment facility that forms a barrier between the contaminated media and the surface, thereby shielding humans and the environment from the harmful effects of its contents. A cap must restrict surface water (rain) infiltration into the contaminated subsurface to reduce the contaminants leaching from the site. HUITEX® VF/VX is made from premium Linear Low Density Polyethylene (LLDPE) resin. Its advantage is to provide excellent flexibility and elongation for the deformation when the waste is settled by decaying in the landfill. Leachate is collected from operating landfill and stored in ponds for wastewater treatment and evaporation. To protect the groundwater HDPE Geomembrane lining system is indispensable to be the primary containment barrier. 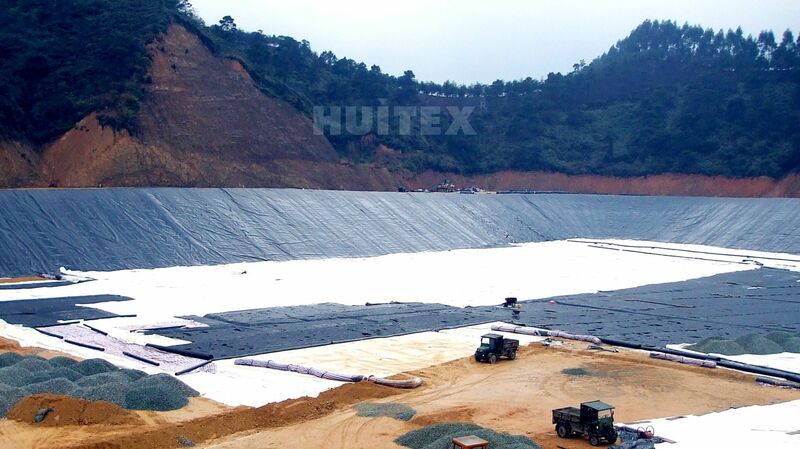 HUITEX® HDPE Geomembrane featuring the excellent chemical resistance, superior impermeability, high tearing and puncture resistance and tensile strength is the most durable and reliable material for leachate ponds.